This is some kind of madness! Look at this fast granny, that is as active as a teenager! She is running on the street and you have to help her dodging the obstacles. 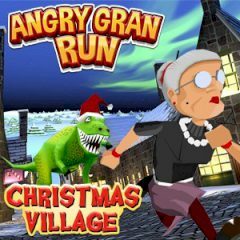 Join the holiday run and help this encouraging granny to have all coins ahead. Yet, there are villagers, wagons and decorated statues on your way. The speed is so high, that you need to make a counter move, if you want to continue the journey. Use the arrow keys to do that!